Home/Uncategorized/We are hiring: legal interns needed! We are filerskeepers: a legaltech startup with a passion for making business decisions smarter, quicker and easier. We see that companies are facing an enormous challenge: they will need to constantly transform their business to keep up with the exponential growth of data and tech, while dealing with increasingly complex regulations and laws. Companies will need to instantly make key judgments, forecasts, predictions and decisions. For this they need scalable, digital and fast advisers who do not only advise but who transform together with their customers. We are here to help companies figure that out. We strive to internalize and re-imagine decision making processes whilst letting go of our pre-conceived expert opinions. filerskeepers was inspired by a problem many companies experience: there was no simple way for IT, Legal, Compliance, HR, Sales, Finance, Health and Safety and other business departments to build data retention schedules and keep them up to date. How do they know what information to keep and what to throw away? As we got to know our users, we discovered that data retention is not a one-size-fits-all. Companies keep data of all shapes, sizes and types—they use it in many different ways. Our goal is to make a strategic data retention tool that allows our customers to know all data retention terms, to see changes in data retention laws real-time and to know what the golden standard our individual customers should apply. We need more team. We need “hunters”. We need you. 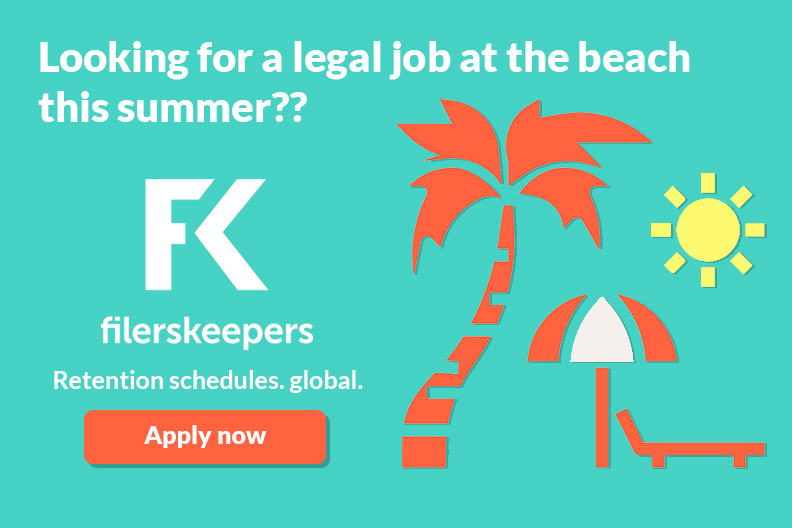 We are looking for ambitious legal entrepreneurial interns that help us hunt retention periods in various laws of the world and supporting retention period hunters in processing their finds into a filerskeepers product. Responsibilities will include all aspects of legaltech content creation; drafting data retention schedules, hunting new retention periods; developing our understanding of foreign legal systems, all in close collaboration with our champions league legal team.